They want the phrase ‘incompatible with life’ banned. A GROUP REPRESENTING parents whose children had or have fatal foetal abnormalities is calling for the phrase ‘incompatible with life’ to be discontinued. Every Life Counts said the term is comparable to ‘retard’ or ‘cretin’. Independent TD Mattie McGrath has drafted a bill attempting to have the phrase removed from official medical terminology. 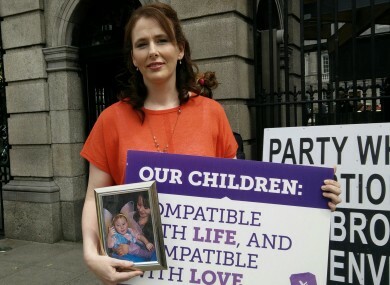 Spokesperson Tracy Harkin said parents with children who are deemed incompatiable with life are “pushed toward one route” – abortion. Harkin said she “absolutely” understands why some women in this position choose to terminate their pregnancies. “We know the fear that this label strikes into your heart. Abortion is driven by fear and a denial of the humanity of the child. Parents are being led to believe their children are just a freak of nature, like monsters, that they’re not fully human. And this is so wrong in this day and age. Tremendous healing has come from spending just minutes with their child – whether it’s minutes or whether it’s days, or in my case eight years. Harkin’s daughter Kathleen Rose has Trisomy 13 and was not expected to live beyond a few days, but is now eight years old. Harkin said her daughter “deserves to be treated just like every other child and not to be discriminated against because of her disability”. The group wants perinatal hospice care to be introcduced and for parents to be provided with better information and counselling options. McGrath said he has received support for the bill from some fellow indepenednt TDs, as well as from members of Fine Gael, Fianna Fáil and Renua Ireland. He said he’s hopeful the government won’t block the bill, but added he’s not confident this will happen. Email “Parents are led to believe their babies are 'freaks of nature' - pro-life group”. Feedback on “Parents are led to believe their babies are 'freaks of nature' - pro-life group”.